With all the talk of his other projects, the recent release of The End Is Nigh and the upcoming launch of The Legend of Bum-bo, you’d be forgiven for having forgotten that weird cat-breeding sim Mewgenics ever existed. It was weird enough to be a fever-dream, at least. Thankfully, Edmund McMillen hasn’t. In this recent Q&A posted on his official Binding Of Isaac Tumblr, he confirms that the project still lives… and is being entirely rebooted, with new concepts being drawn up. And that’s just the tip of the iceberg. Between Meat Boy and Isaac, it can’t be argued that Edmund McMillen has left a huge mark on the contemporary indie development scene. Here’s some of our favorites of the past few years. Edmund McMillen and Tommy Refenes have officially gone their separate ways, with Tommy retaining control over the Meat Boy license, and the Team Meat name. Here’s hoping we’ll see more of everyone’s favorite platforming steak this year. The Legend of Bum-bo (Binding of Isaac meets Puzzle Quest with some tactical RPG elements) is out soon for PC, Switch and iOS, and should be receiving a new trailer and a release date in the coming weeks. He also confirms that it’s technically a prequel to The Binding Of Isaac. 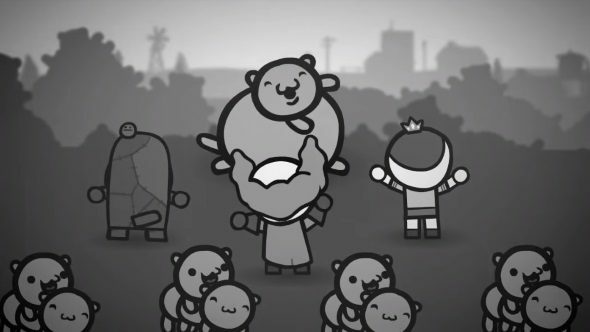 The End Is Nigh was a relatively minor success, but the game means a lot to Edmund, and came about during a difficult time in his life where he was considering giving up game development at all. It was largely developed in quiet, behind closed doors, and he admits that it likely would have been more of a commercial success if they’d devoted more time to marketing and hyping it. Ouroborous – the procedurally generated platform/shmup hybrid that eventually mutated into The End Is Nigh as they cut away extraneous concepts bit by bit – is in hibernation for now, and they may return to the concept at some point, but for now they’ve got their hands full with both Bum-bo and Mewgenics. In a wise move towards a more healthy work/life balance, he’s becoming less of a workaholic and learning to take things easy with his family. As much as I’d love to see him locked in a dark box and forced to churn out fresh games 24/7 for my amusement (that is a joke, I wouldn’t love that at all), it’s probably for the best that he’s looking after himself and his kin. Lastly, he teases that while he was sure that The Binding Of Isaac was a truly finished project, there might be one last piece of DLC due for the game, although he doesn’t want to give away too much right now.